With Time Capsules epidemically failing after an average of 18 months and 22 days, it might be time to start thinking about an alternative use for your pristinely albino, Apple-branded router once its body squirts out its last breath of 802.11-n ectoplasm. Why not turn it into a lovely gift box? Over at Instructables, there’s a handy little tutorial on how to convert a Time Capsule into an ornamental box worthy of display, simply by prying it open, gutting it, then adding hinges and a silk cushion. 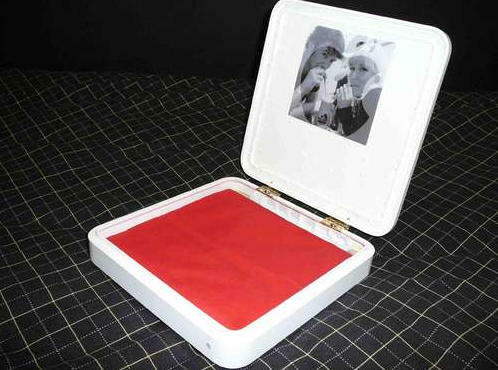 Not the most revolutionary use for an old Time Capsule’s casing, certainly, but this would be great presentation for, say, an iPod Touch gifted to a loved one later this month, and it can even be reused as a jewelry box or even a humidor (for cigars or the disembodied fingers of people who owed you money, you decide).